Your furnace is responsible for keeping your home warm during the cold winter months in and around Springfield. The last thing you want to do is wait for a blizzard to realize that your furnace is in need of replacement. Is your old Springfield furnace costing you thousands on higher than usual electric bills? Call (937) 488-4758 and find out about our affordable and professional furnace replacement and installation solutions today! A furnace, on average, should last roughly 10 years. In areas such as Springfield, where furnaces see heavy use in the winter, that life may be cut down even further. This is especially true for homeowners who fail to perform the needed maintenance on a regular basis. If your furnace is older than 10 years, and you notice that it is no longer operating as it used to, chances are it’s time for a replacement. At CJS Heating & Air, we help customers in and around Springfield with all their furnace replacement and installation needs. From finding the right furnace, to installing it according to factory standards, our staff has the skills needed to get the job done. 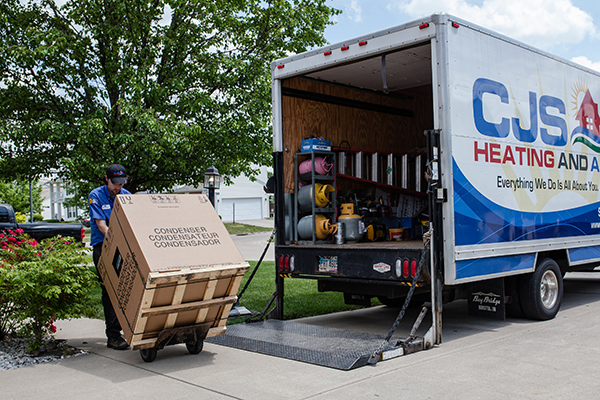 At CJS Heating & Air, our goal is to guarantee the comfort of all our customers in and around Springfield. That is why we offer the highest quality furnace installation and replacement solutions in town. First off, we can help you determine whether or not your furnace needs to be replaced. If you find that it does have to be replaced, we can also help you find a furnace that will work efficiently when cooling your home.